Use your phone to scan the barcode of your grocery shopping. Safe for vegans will help you read the product labels in the blink of an eye! Products scanned and available within our database will be clearly categorised as: vegan, vegetarian, non-vegetarian and ‘maybe’. Our app stores a list of your favourite products so you never lose them again! You can favourite your scanned products or any product from our database. You can search through our database, your scanned products and your favourites. It has never been so easy to discover new vegan products. Have we got a product wrong? Can’t you find a product on our database? Let us know! The vegan community needs your input. You can access SFV both offline and online and always as a guest. No need for registration and no surprises on your data plan – as simple as that. 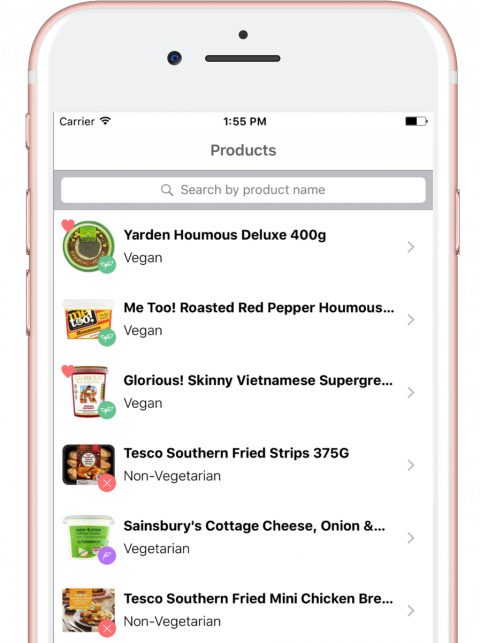 SafeForVegans aims to make the grocery shopping of a vegan simpler by providing useful data and technology that drive informed buying decisions. Our app is very easy to use and our services are available both off-line and online. SafeForVegans has the most extensive list of vegan products in the United Kindgom. Via an iOS app, we want to make this data easily available to as many people as possible. Tired of wandering around the supermarket looking for vegan products? We’ve got your back!